Writing a lot and writing well at the same time? It’s not easy, but it’s possible. I know of writers and overall content creators who publish a new piece of content every day — and their work is usually good. But not always great. I also know of creators who publish new content less frequently — and it’s always phenomenal. And then there are those people who can crank out new stuff every day and CRUSH IT (meaning dominate, succeed, do a really good job) every time. How do those superhumans do it? Odom now has an answer to that question, having written his first book, Failing Up: How to Take Risks, Aim Higher, and Never Stop Learning. The book is part auto-biography and part inspirational text, with Odom relaying stories of life lessons he’s learned from childhood, through his Broadway debut in Rent, and up to his Grammy- and Tony-winning work in Hamilton. I was not looking for this book but a review caught my attention. I thought it might be an okay book but as I read it, I realized it was one of the best books I have read lately. It begins by describing what it is like to live as a full citizen in a nation. Then it contrasts this with what it is like to live in a colony controlled from a distance and where you do not have citizen rights but rather become a commodity to be used as seen fit by the nation doing the colonizing. 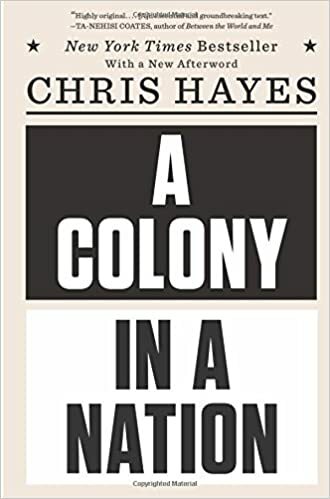 Hayes describes life in colonized places around the world and concludes that there are also colonies in America where residents do not have citizen privileges or at least have them minimized as much as possible. Undue burdens are placed on them to benefit those living in the nation but not the colony. The police are seen as a colonizing force. People living in these colonies are marginalized, seen as a burden rather than an asset to the larger society and oppressed. They are compressed into what we have called ghettos and pockets of poverty. As much as possible they are hidden from public view and herded into substandard living conditions. Programs known as war on crime have not produced any substantial decrease in crime, but if anything have increased crime, police violence and a punishment system unmatched elsewhere in the civilized world. His suggested solution is to help those living in our colonies find a way to develop their skills and make a contribution to society. We need to learn how to listen to them, accept them and help them become part of our nation and become full fledged citizens. This book is a challenge to all of us to remake our society into one which respects and cares for all its citizens. It will not be easy to undo the damage we have done but it is never too late to start. So the opposite of addiction is not sobriety. It is the human connection. the people who care about us and support us in times of strife. Lately I have been discouraged by the fractures I see in society and in our daily relationships. It feels like half of us are on each side of every issue. We tiptoe around people we don’t know well in order to avoid uncomfortable and heated conversations. At times through the course of our history we have been able to look to our government leaders as a source of leadership. Now we see the same divisions among our would-be leaders as we find in our communities. I have been waiting for our leaders to rediscover common sense and the ability to bring us back together. The longer I wait the more frustrated and disillusioned I become. I have been tempted to see the world in which I grew up as gone. Another way of life may be on the horizon although it might not appear in my lifetime. Maybe I have nothing left to contribute. Then it occurred to me that elected representatives and officials did not appear out of thin air. Everyone elected is in office because some of us voted for them. They are in charge only because we let them be. If we don’t like the direction our community, nation or world is going, it is up to us to change it. If we want our leaders to cooperate with each others for our benefit, it is up to us to learn how to get along with each other and insist with our votes that those we elect do the same. How do we make this change? We need to start with our own perceptions and feelings. We need to be clear on what we want. We also need to understand what others want. The hard part is to balance the two sets of needs. To do it, we must listen to each other. Criticizing everyone who differs from our ways just leads to more conflict. Learning to understand what others want and finding bridges between us and them is the next step. I have wondered where to start this process. I discovered one way this morning. I sat in McDonalds, drinking my coffee, eating breakfast and writing in my journal. I noticed the music playing in the background. It consisted of some of my favorite folk ballads from the 1960’s. When I finished breakfast, I told the woman at the register that I would like to register a compliment. I told her how much I enjoyed listening to the music. I could tell that my comment brightened her day and mine as well. I also visited Aldi’s this morning. I found the store completely rearranged while I was away for the past month. I told the checkout clerk that I liked the new store layout and that it must have been quite a project to make the changes. She also brightened up and we parted both wearing smiles. These encounters might seem small to you. What if we all looked for ways to compliment each other? Perhaps this might be a start back toward more civilized and mutually supportive communities. Perhaps this would lead to more constructive conversations. Please join me and give it a try. Calliope: Good afternoon Joe. I haven’t heard anything personal from you lately. Joe: You are right. I have’t known quite what to say. Calliope: I haven’t seen you lost for words for some time either. Joe: I haven’t felt that way in a long time. Joe: When I wrote articles and books in the past, I felt I had something to offer my readers. I thought I could inspire them, help them find a way toward their goals and address brambles along their way. Joe: All I see is thorn bushes. Our country and the world seem to be crumbling. Once I thought many people were working toward a world with opportunities for everyone. Lately I see much of the progress made in the past as unraveling. Too many people seem to want what pleases them for the moment with little regard for their long term well-being or for what happens to anyone beyond their immediate circle. Joe: It is and I am not sure what to do about it. My plan is to look for a way to become refocused and find some positive goals for myself as well as for those with whom I come in contact and those around the world I have never met. Calliope: I wish you well and hope you find a way to get back on track. Joe: Thanks. I will do my best and let you know how I make out.. I don’t know about you, but if given two months to write something, whether it’s 2 pages or 20 pages, I wouldn’t be starting immediately. Nope, you’d find me procrastinating on the writing up until the last day or two, then scrambling to get it done. After a bit of panic, I’d finally go into total focus mode and bang it out just under the wire.